for providing me with the idea – THANK YOU Poetic!!!!! Further note: I would ask all contributors to be RESPECTFUL to the opinions of others. This is not an opportunity to ‘shout’ others down or forcibly exert your own opinion over anyone else’s. THANK YOU. Room 101 and Money: What I Hate about Money (or the root of all evil). Money makes money, and while the rich get richer, the poor get poorer. What I dislike the most about money is the inequity it can bring to people and to life. Let’s be honest, money does in fact make people’s life easier. With money more opportunities, possibilities and doors are open to you. With money you don’t necessarily have to prove your worth, other than by flashing your cash (your literal worth). It seems that if you have wealth, you’re somehow more important to everyone, and those with wealth are very nearly untouchable. Unlike the rest of us, many of the wealthy aren’t always subject to the same laws, rules, governance and so on that dominate our lives and circumstances. It seems that having money elevates you and your standing in the world; which seems so superficial and cold. I cannot quite understand how anyone can be measured solely on one element of themselves, and that element is strictly material based. Sometimes it seems that people value money more than their own self or ‘soul’. Without money, it seems that you are merely left behind in the world, and the division money creates in life only increases between those who have and those who don’t have. This division is very clear when we consider the daily and force-fed media messages we receive. Telling us all that we have to spend money, we have to obtain money and that we have to emulate the life of some rich and powerful person. Money signifies status, grandeur, power, beauty and success and so on, One example of this, and one I particularly hate, is glib programmes regarding the money and lifestyles of the rich; the Russian billionaires, the business tycoons, the footballers, the ‘pop’ stars and so on. I find this type of ‘information’ to be trashy and inappropriate, especially when nearly 1/2 of the world’s population, more than 3 billion people live on less than $2.50 a day. More than 1.3 billion live in extreme poverty, that’s less than $1.25 a day, and not to forget the 2. 1 billion children worldwide living in poverty. I know these programmes are supposed to offer escapism from the reality that people are impoverish, and are scraping by in meagre existences. But, it feels as though all of this wealth promotion is just a slap in our already sore faces. All of this wealth culture seems to be saying that ordinary life isn’t good enough, because it is missing something, and that ‘profound’ something is the absence of a large bank account, oh, and a yacht. For those of us without a yacht we still live a life; why then are we made to feel that we’re missing out? Why is it we are told we have to be wealthy or at least pretend to be? The myth of wealth creation annoys me too, because no one wants to accept that gaining wealth often is a hopeless hope and impossible dream. It is rather like the ‘stick’ the lottery conjures every week to make us yearn for the ‘carrot’. People pin their entire hopes on winning the big ticket so they can change their lives overnight. I actually know people who have a lottery plan, and in this is everything they will do, once they win (good luck with that one). I feel these people are wasting their lives by chasing money that will in reality never be theirs. They seem to believe that without this money their lives are empty and their being is meaningless. Yes, money does have a great power to motivate us all in our lives, so much so that people will kill, lie, cheat, steal, bribe, kidnap and all the other bad things we will do just to get it. Is it fair that so few have so much?? When you consider that eighty people have as much wealth as 50% of the rest of humanity it kind of makes you wonder why, and who those people actually are and what they actually do?! I am not suggesting that we redistribute wealth. In my opinion that won’t work. Yet when people make money, such gargantuan amounts, do they ever stop to think about those who don’t literally have a pot to urinate in? Do they ever think about how they actually made that money? Do they consider just how privileged they are in the world? Do they even try to make a difference and help others? In many cases I doubt they do, and not because they don’t necessarily have a moral conscience. It is just because if they were so eager to change the system that provided them with money, then they would no longer be wealthy and reside in such a privileged position in life. Money does after all make money, and the system helps to grease the wheels that turn it. So for me, I suppose I hate what the prospect of money can do. How it can turn people into greedy, lying, cheating, desperate sharks. I hate how money unsettles the balance of power and control in life. I hate how poorer people are often left to founder when there is so much wealth in world. I hate how we value money often more than life and that without money people feel that their life and selves are unfulfilled and stunted. Let me have your opinions, and let me know if you think what I hate about money deserves a place in Room 101. Just to recap what my Room 101 posts are about, for those of you, and there are many, who haven’t bothered to read or got involved with my previous post (thanks for your support)! I will be writing about things I wish to banish from the world because I hate or dislike them. These Room 101 posts will be inspired by subjects, and these subjects can cover anything, basically anything goes. So for example subjects could be; ‘Modern Life’, ‘Going Out’, ‘People Who Are Happy’, ‘Stereotypes’, ‘Banks’ (and so on and so forth). Whatever subject is chosen by my readers, I will then write a post about and state what it is I hate or dislike about this subject. Then you, the reader, can decide if I have made a persuasive enough argument to actually banish what annoys me, to Room 101. OK, reasoning behind for post is now over so let me explain; why I dislike Censorship. Draconian censorship is becoming an increasingly common tactic among people who have the audacity to consider themselves liberals. Freedom of expression has always seemed to have its exceptions, never more so than via legally proscribed hate speech. This hate speech restriction, has encouraged a culture of almost denial. Censorship or restriction of it doesn’t fully address specific issues around intimidation or incitement. The only solution available; enforcing general social regulation – as though this helps change the situation! This muted confusion is why hate speech laws across the world have no consistency, and therefore no real validity, because people don’t know or can’t agree on what actually constitutes as hate speech. Britain bans abusive, insulting, and threatening speech. Denmark and Canada ban speech that is insulting and degrading. India and Israel ban speech that hurts religious feelings and incites racial and religious hatred. In Holland, it is a criminal offence to deliberately insult a particular group. Australia prohibits speech that offends, insults, humiliates, or intimidates individuals or groups. Germany bans speech that violates the dignity of, or maliciously degrades or defames, a group. And so on. In each case, the law defines hate speech in a different way. So one response to this legal censorship might be to say: Let us define hate speech much more tightly. I think, however, that the problem runs much deeper than definition. Hate speech restriction is a means not of tackling bigotry but of re-branding certain, often obnoxious, ideas or arguments as immoral. It is a way of making certain ideas illegitimate without bothering politically to challenge them. And that is dangerous. 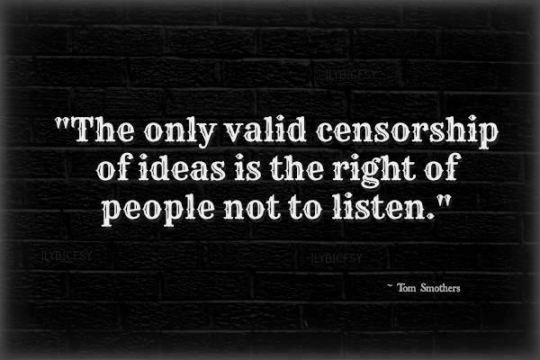 Censorship just sweeps the problems under the carpet, but doesn’t solve a thing for society in the long run. Now you decide what you think. Should censorship or legally proscribed hate speech be consigned to Room 101??? Comments please and suggestions please!!! Attention all readers!!! I am asking all of you (at this blog and those I guest write for), to become more interactive with what I write. By that I mean, voting on my posts and also choosing the topics I write about. I need feedback for my Room 101 posts. I’m going to be writing about things I wish to banish from the world because I hate or dislike them. Does this make sense??? I hope so………………….! So, these posts won’t work unless I gain your feedback and your involvement in choosing the subjects I will then write about. To kick off these Room 101 posts I have chosen the fist subject; ‘Modern Life’. The use of silly acronyms, especially, Y.O.L.O or ‘you only live once’. “You only live once” seems to be a phrase used in conjunction with excusing something someone wishes to do that most probably others will frown upon. It’s a phrase, which I feel screams vapid and glib. Is this what the modern world is?? Why should we concern ourselves with politics, law, money and love, because if we only live once, and live for the now, why bother thinking of others and what comes next? For me, Y.O.L.O encourages people to adopt a selfish, self centred, self serving, egotistical, hedonistic approach to their life and take others for granted. If Y.O.L.O isn’t meant as; do all you can, get all you can and to Hell with the consequences then what in fact does it truly mean? Does anyone ever consider the meaning before they say Y.O.L.O? Are people in the modern world less inclined to think before they speak? I would love to put this Y.O.L.O saying to the test, and see where it gets me! It might make a good sociological study; test the theory of how Y.O.L.O makes you less interested in anyone but yourself! The Y.O.L.O ‘theory’ could inspire a damn good comedy film! Or is it in fact already a title to a James Bond movie?? Anyway, I for one would like to banish the use of Y.O.L.O to Room 101, because for me it has no viable usage. It’s senseless and stupid and we wouldn’t miss it if it wasn’t part of some urban dictionary or online chat room. This is where you, the reader, gets involved. Tell me what you think, decide if Y.O.L.O should be banished to Room 101 and then set me another topic to write about (and we begin the process again). I look forward to reading what you come up with! !